Update: Nikon D7000 is now in stock and can be used in combination with the Nikon instant rebates. Update #2: Nikon Canada will also have a rebate program - 80 CAD off any dual lens kit (effective till March 31st). Nikon sent out a memo to US dealers today that the current Nikon instant rebates will be extended till February 26th, 2011. Multiple lens rebates can be combined with the purchase of one qualifying Nikon DSLR body. The Nikon rebate program started on March 1st, 2010. It is important to note that almost all other manufacturers have ended their rebate programs after the holidays. 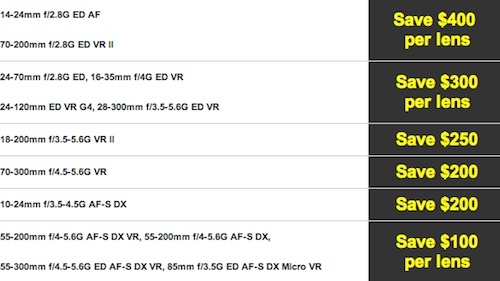 Several readers emailed me about a potential price increase on Nikon products on February 1st. I don't think this will happen (at least not on February 1st).